Rick Banks knocks the same knock at every house he approaches. It’s rhythmic, not heavy-handed, yet with purpose. “I’ve gotten a lot of good feedback,” Rick says of the knock, noting that people said it’s how they knew he wasn’t threatening. Not unlike many central city neighborhoods, most screen doors are locked and residents are apprehensive — many peek through their window or yell through the door before coming out. Still, there are others who refuse to answer, evidence of the deep distrust that exists. “It’s a fear thing,” according to Banks, a candidate to represent the 16th State Assembly District, which includes swaths of the East Side — including parts of Riverwest, Harambee and Brewers Hill — and the near west side, to 35th Street. When Rawls moved into a home near 22nd and Walnut streets 30 years ago, it was the only one on the block. Because of this, it was a target for theft, she says. The area, which was largely vacant, began to fill with homes, many of which were built through Habitat for Humanity. As the neighborhood began to fill with more people, Rawls says she experienced less break-ins; the drug deals that regularly occurred in front of their home eventually moved to the block just south. Still, the family has had lawn mowers, snow blowers, bikes and more stolen. In one particular instance, a man Rawls sheltered in their home after he claimed to have been robbed took her daughter’s wallet. Rawls, who holds a master’s degree from UWM, admits the poverty that afflicts much of Milwaukee is at least partially to blame for the crime she and others have experienced. And, while immediate resident concerns include fixing poorly maintained roads, reckless driving and replacing a stoplight that was recently knocked down, much deeper issues are at play. This census tract — bounded by Brown, Galena, 27th and 20th streets — seems to be more stratified than other distressed central city neighborhoods. While per-person income is only $17,172, median household income is more than $20,000 higher and 11 percent of households bring in more than $100,000 a year. Ninety-five percent of residents — 90 percent of whom are Black — have been in the neighborhood more than 10 years, and two-third of the houses are owner occupied. Still, some residents described feelings of helplessness, particularly in relation to housing and employment. They expressed a desire for something better, yet are doubtful that a system which hasn’t worked for them in the past will ever change. Christina Bonds, a single mother of four, aspires to home ownership but hasn’t been able to save enough for a down payment on her $11-per-hour wage. Bonds, who has worked in factories, as a home health care worker and in food service, wants to become a nurse but doesn’t have the time or money to acquire the education necessary. So she remains in the rat-infested 3-bedroom apartment she rents for $925 a month. Bonds, who grew up not far away, near 29th and Brown, says all she wants is for her children, the youngest of whom is 3, to have a better life. “I want them to be in a safe environment where they can go out and play.” She says the biggest barrier for her to attend nursing school is the cost of childcare. “There’s a system at play,” says another resident, who has lived in the neighborhood for more than 40 years. They worry about being pushed out, pointing to recent moves by corporations and monied interests to expand Milwaukee’s downtown area. The resident requested their name not be shared for fear that such statements might make them a target, of whom they were unclear. Courtney Nabors, a resident of North 24th Street, lost his driver’s license and has been unable to get a new one because of back child support. He points out that this condition prevents him from getting to “the good paying jobs” so he can repay that debt. He said understanding is important. Banks, a community organizer by trade, was considering law school and had just accepted a position with Black Leaders Organizing for Change (BLOC) when Leon Young, who represented the 16th District for 25 years, stepped down. Banks, who grew up near 23rd and Hopkins before his family moved to the Lapham Park Housing Projects, said he couldn’t pass up the opportunity to run. An openly gay anti-capitalist, Banks says the state’s priorities — which he claims value large corporations over individuals — need to change. His platform focuses on reforming the criminal justice system and developing community-based economies. According to Banks, investing in the local efforts of individuals will protect folks from the instability that can come from relying on large employers. Banks also supports full legalization of cannabis, raising the minimum wage and expanding access to health care, child care and mental health services. Creating a healthy environment by investing in sustainable energy, affordable housing and urban agriculture is a pillar of his candidacy. And, Banks faces an uphill battle; he doesn’t have name recognition or loads of money. Signs promoting 19-year-old Kalan Haywood II — the son of a local real estate developer — and Milwaukee County Supervisor Supreme Moore Omokunde (whose mother is Congresswoman Gwen Moore) can be spotted in store windows and front yards throughout the district. 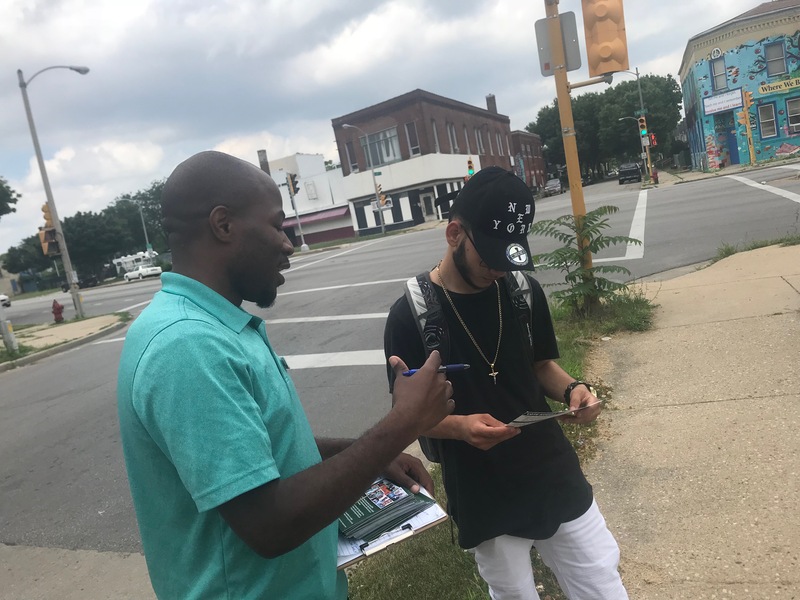 Banks is hoping to turn out first-time voters, and individuals who may not have voted in a long time, but he says that’s hard to do without financial support, which would allow him to pay canvassers and purchase materials, such as signs (most of Banks’ campaign has been powered by volunteers). Still, he’s hit the streets, knocking doors and speaking with residents, almost every day since mid-June. He says he’s encountered some people who say they don’t vote or don’t plan to; some have been discouraged by recent events and, for others, it simply isn’t a priority. But, according to Banks, nothing will change if people choose to stay silent. “I always vote,” says Mary Jackson, another longtime resident Banks spoke with while canvassing. Though she couldn’t say whether or not she would vote for him, she feels she can’t complain if she stays home on election day.